Chem-Dry's patented Carbonating Cleaner is applied using a low pressure applicator that applies millions of microscopic carbonated bubbles into your carpet, then with the power of carbonation lifting the dirt and grime to the surface to be extracted and swept away forever. 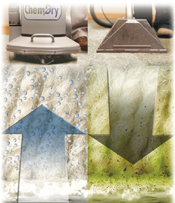 This process leaves your carpet in a drier and cleaner state, more than steam cleaning accomplishes. Unlike the Chem-Dry process, steam cleaning frequently uses high pressure that forces water down through the carpet backing straight to the pad. This leads to buckets of water that can be left behind trapping soapy, dirt-attracting residue deeply imbedded in your carpet, creating the risk of reappearing spots and a potential breeding ground for mould and bacteria.